Product #1359 | SKU JB01235 | 0.0 (no ratings yet) Thanks for your rating! Flexible Tripod for compact cameras and mini camcorders. 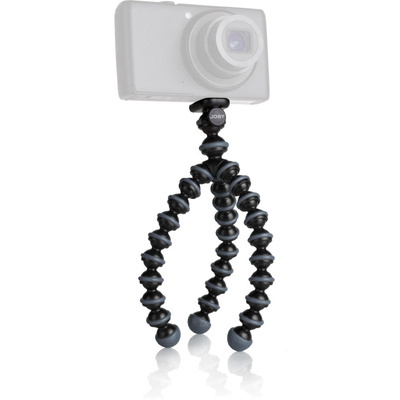 The Joby Original Gorillapod (Gorillapod 1) is a flexible tripod designed for digital cameras weighing up to 275 grams. The Gorillapod is the ideal camera accessory for photographers on the go. Throw it in your pocket or backpack and you'll be ready for your next adventure! While the Gorillapod serves all the functions of a traditional camera tripod - steadying your camera under low-light conditions, taking timed group shots, etc. It is the only tripod malleable enough to provide you with the perfect shot while wrapped around a tree branch, hanging from a pole, or perched on a jagged rock. The possibilities are endless! Connection is a removable clip with universal 1/4" tripod screw.